Baldwin has a 60 year legacy of craftsmanship and innovation. Rated #1 in quality by builders and contractors, Baldwin is pleased to offer a line of luxury hardware for the discriminating consumer, our Prestige Series. Feel the difference - Baldwin hardware is solid throughout. With a 60 year legacy of superior style and quality, Baldwin is the choice for an elegant and secure presence. Timeless beauty is captured in the graceful curved shape and slim silhouette of the Segovia handleset. This single cylinder handleset can be locked or unlocked by a key on the outside, or the turn button on the inside. Tobins refined curves and sleek contours are delightful to the eye and pleasing to the touch. The Polished Brass finish adds to the traditional look and feel of the product and makes a classic statement. SmartKey Re-key Technology allows you to control who has access to your home. Re-key the lock yourself in seconds in 3 easy steps. Have you recently moved or had a child lose a key. Storm & screen door Keyed locking push button handle set. Includes outside push button handle with key lock with heavy duty inside latch. This handle set is designed for out-swinging doors 1 inch - 2 inch thick. The inside latch can be locked and unlocked from the outside with the key. The inside latch also features a anti lock-out mechanism. The outside handle has a screw hole at the bottom to install a screw to protect the handle. The set includes a spindle with spring, a latch strike with 2 shims, and several lengths of screws for the handle and strike installation. This is a classic looking storm or screen door handle that be used on aluminum, vinyl or wood storm and screen doors. Ideal Security has been supplying quality hardware products since 1956. Prestige Segovia Single Cylinder Polished Brass Handle Set with Tobin Lever and SmartKey Baldwin has a 60 year legacy of craftsmanship and innovation. Rated #1 in quality by builders and contractors, Baldwin is pleased to offer a line of luxury hardware for the discriminating consumer, our Prestige Series. Feel the difference - Baldwin hardware is solid throughout. With a 60 year legacy of superior style and quality, Baldwin is the choice for an elegant and secure presence. Timeless beauty is captured in the graceful curved shape and slim silhouette of the Segovia handleset. This single cylinder handleset can be locked or unlocked by a key on the outside, or the turn button on the inside. Tobins refined curves and sleek contours are delightful to the eye and pleasing to the touch. The Polished Brass finish adds to the traditional look and feel of the product and makes a classic statement. SmartKey Re-key Technology allows you to control who has access to your home. Re-key the lock yourself in seconds in 3 easy steps. Have you recently moved or had a child lose a key. 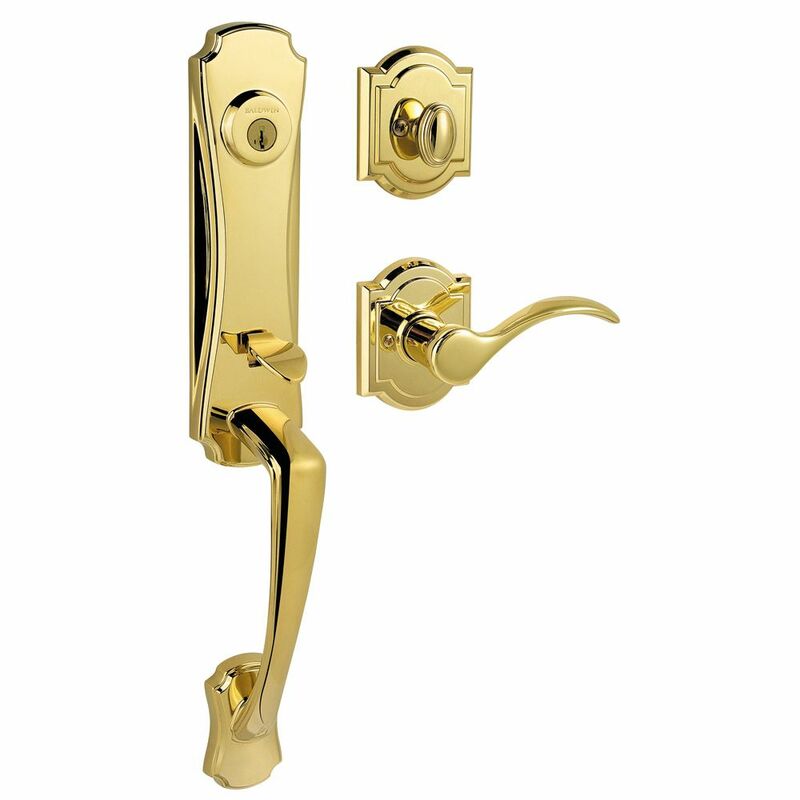 Prestige Segovia Single Cylinder Polished Brass Handle Set with Tobin Lever and SmartKey is rated 4.7 out of 5 by 7. Rated 5 out of 5 by selhmbldr from Customer wanted to upgrade her door and this was a great addition to her "Classic" look. Customer wanted to upgrade her door and this was a great addition to her "Classic" look. Rated 5 out of 5 by KJ from This handle set is both great looking and very well made. We hope to get many years of use from it! This handle set is both great looking and very well made. We hope to get many years of use from it! Rated 5 out of 5 by SeyedN from Awesome product Product was Very attractive and easy to install. Stylish and elegant. Rated 5 out of 5 by seniorstudent from Beautiful Handleset Looks gorgeous installed, and is very smooth and quiet when locking or unlocking the door. Rated 4 out of 5 by Franklin43 from Great looking.... Great looking product but, I'm a little disappointed. I had asked for solid brass and thought that is what I was getting. For the price...This disappointment aside, and the fact that we were having the house repainted so I didn't have time to return and re order, I am very pleased with the unit. I had to chisel a little for the difference in the latch position but, I expected that. The installation was simple and the re-keying was very easy. I am hoping that I don't have to use the lifetime guarantee on the finish.